Asakusa is one of the main attractions in Tokyo, for both Japanese and foreign tourists. Getting there is easy. The Asakusa subway line and the Ginza subway line both stop there. Asakusa is the name of the area that surrounds Senso-ji, a large temple complex with ancient roots. The area was also closely related to the bright lights of the entertainment world up until the post-war period. The lights were dimmed when the U.S. occupation forces imposed stricter prostitution laws and the more x-rated establishments had to close their doors. Never-the-less, today there is still plenty to see and do. 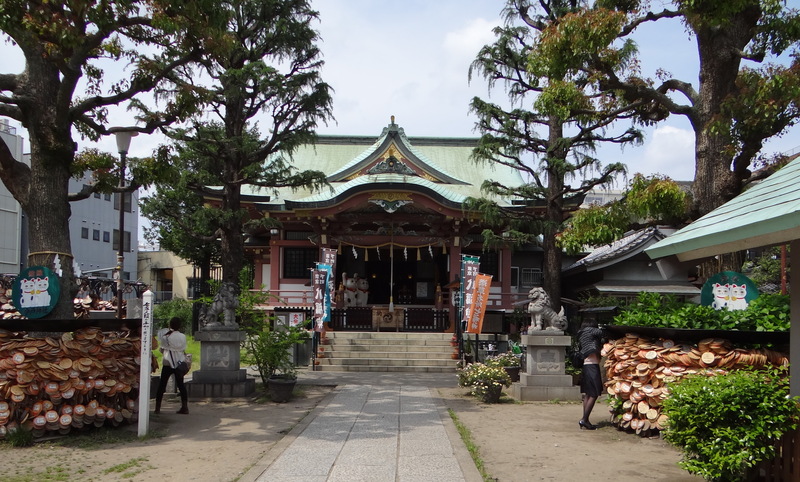 Once you pass through the famous main temple gate, called Kaminarimon, you will find a long row of small souvenir shops called Nakamise (literally means, “inside shops”). They sell all of the most popular and typical souvenirs, and some rather obscure ones too. Of course, as you browse through the shops you will see many maneki neko and that is only natural because Asakusa is the perfect environment for the maneki neko, as it has been a gathering place for buyers and sellers for hundreds of years. Merchant culture here stretches way back to the beginning of the Edo period. In fact, if you take a little stroll, away from Senso-ji, you will find a shrine connected with the very roots of maneki neko. This is Imado Shrine (jinja). Walk back to the main gate, Kaminarimon, turn left and walk along a wide avenue. Within 10 minutes you will come to a main intersection, just before the road continues and crosses the Sumida river, Tokyo’s main water thoroughfare. Cross the intersection, turn left and you will enter the cool and shady Sumida Park, which runs along the river. Continue walking through the park for about 15-20 minutes. It might take you longer, however, as you will probably be tempted to stop and stare at the impressive sight of Tokyo’s latest modern attraction on the other side of the river, Tokyo Sky Tree, currently the world’s tallest tower. When you come to the end of the park, continue walking along Edo Avenue, and in about 5-10 minutes you will come to a spot where another road splits off to the left from Edo Avenue. At this point, it’s best to stop somebody and ask them where Imado Shrine is. It’s close, but a little difficult to explain clearly here. Once you’re there, though, you’ll know right away that you have arrived in maneki neko territory. Pass through the tori gate and you will see masses of round, wooden votive tablets (ema). These are the wishes of shrine visitors. Imado Shrine is known for its matchmaking powers, so many messages are related to finding the right partner. 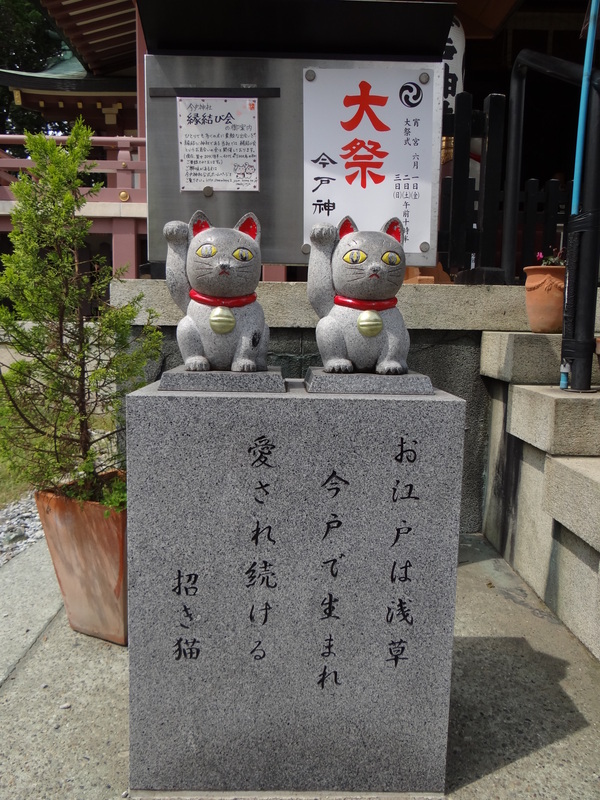 As you approach the shrine, you will see two granite maneki neko sitting on a plinth at the base of the shrine stairs. At the top of the stairs there are two very large maneki neko standing at the entrance to the shrine [see top photo]. A bit intimidating! Go back down the stairs and to the right is a small shrine sales office where you can buy the ema and also different kinds of charms, all showing the maneki neko image. Next to the office there is another small building containing a varied and extremely colourful collection of maneki neko dolls, creating their own sacred space. 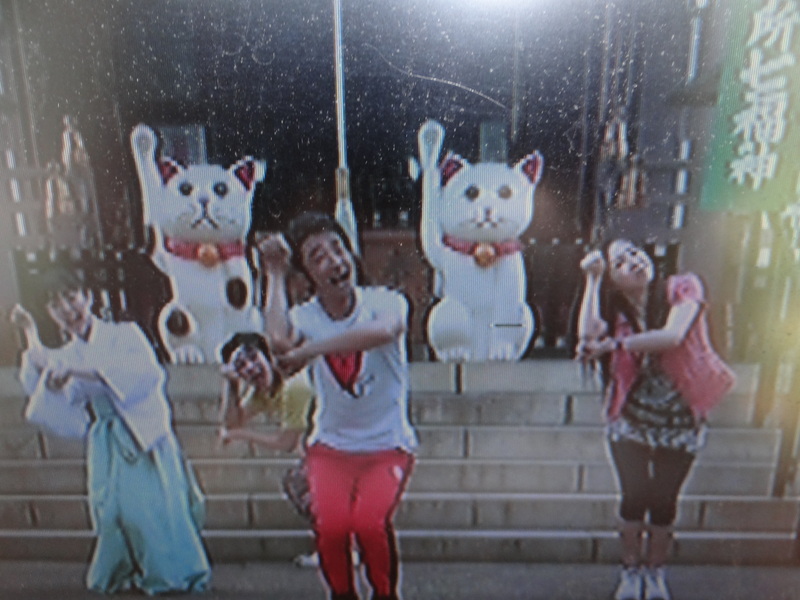 There is also a small TV which plays a dvd of the maneki neko dance, performed by some shrine maidens and a TV personality, whose name I forget. It’s bizarre and hilarious and, of course, very cute. All in all, it’s a true hot-spot for maneki neko. But why? Imado Shrine is in an area called Imado, and in days long gone, many potters lived there, and they produced a kind of pottery that came to be known as Imado ware. 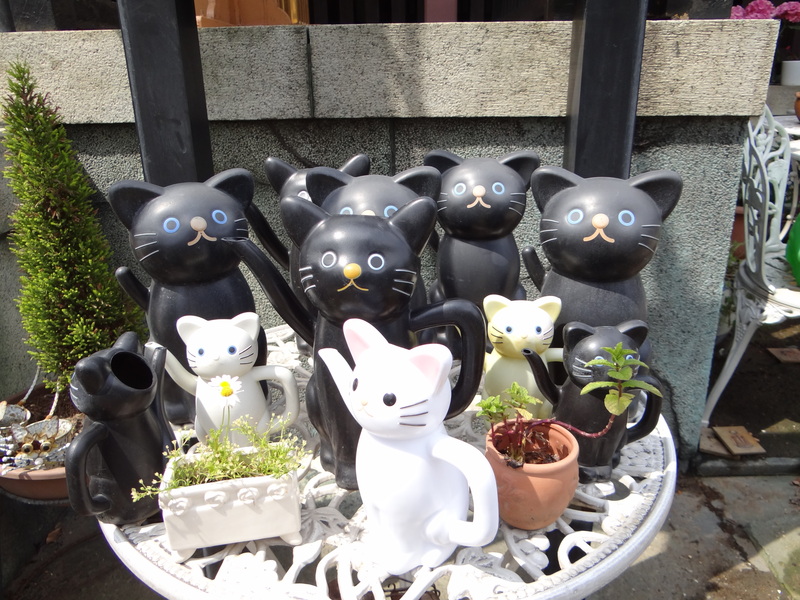 Some of the earliest examples of maneki neko were made here, so this is, in a way, the birthplace of maneki neko. I can just imagine some sharp merchant at Asakusa back in the Edo period hearing one of the legends of the maneki neko, then going to nearby Imado and commisioning a potter to make some figures of a cat with an upraised paw to sell in his shop. The rest is history. From Imado and Asakusa, maneki neko has spread around the world. Unfortunately, there are no potters living in Imado anymore, but back at Senso-ji, in the Nakamise area, you will find a shop called Sukeroku. It is the second from the end on the right, close to Senso-ji temple, and if you don’t slow down you might just pass it by, which would be really unfortunate. The shop has been run by the same family for about 150 years, since the end of the Edo period, and they sell all sorts of small, handmade ceramic figures. Some are replicas of toys from the Edo period and some are tiny scenes of Edo period street-life. In a space that allows no more than two customers at a time, you can see hundreds of these tiny figures lining the shelves. Of course, there are many variations of the maneki neko –some very humorous, some I’d never seen anywhere else. 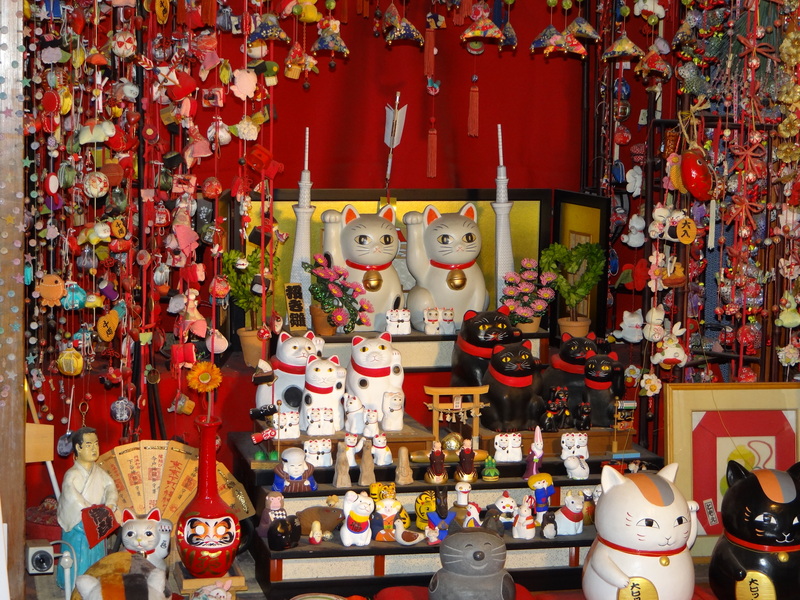 Spend some time in the shop and you will step back in time to the days when all of Edo’s citizens came to Asakusa to pray and play and eat and laugh, and perhaps, also buy a maneki neko to take back to their homes. I want a watering can maneki neko! I suppose I’ll have to go to Imado to get it though. Imado Shrine is now on the itinerary for my Japan holiday next year.